Many believe that efficient part nesting requires a human, but this no longer is true. In fact, humans cannot make the rapid multi-factored decisions needed to optimally nest material in a modern fabrication facility. In such an environment, variables to be considered include JIT, part association across multiple dissimilar materials (kitting), hot parts in the next machine cycle, response to schedule changes with each machine cycle, machine breakdowns, continuous part flow, engineering design changes, shop-floor flow optimization, setup optimization, common cutting and common punching. *Many factors influence cost savings, so actual savings will vary. Simply put, with so many variables, it is impossible for a human to respond in time using interactive tools. Fortunately, nesting has advanced to automatically and optimally tackle these variables, reducing operator involvement in day-to-day nesting and part programming tasks. This leaves time for operators to perform other tasks and upgrades those tasks to enable continuous improvement. The latest automatic-nesting technology, referred to as the new paradigm, can result in material efficiency improvement from 8 to 16 percent and may bring productivity gains of 150 to 250 percent. Such nesting is integrated, with connections to company CAD and ERP systems cutting human effort and transit time. The latest nesting technology uses a knowledge base that can consider variables that impact the final results, replicating the value system used by humans. The main advantage of such a system over a human is its ability to consistently and rapidly consider all values that impact the final results. For example, the knowledge base is configured with a fabricator’s JIT policy, its material efficiency goals and all kitting requirements. The system uses this information along with additional mission-critical data to find the best alternative. In a short period of time it can select the best alternative that optimizes all of the criteria in the knowledge base. Speed is what transforms such a system from nesting technology of the past, the old paradigm, and from human-managed nesting. If we assume that a brilliant human could achieve the same solution, it would take our human hours, days or even months to sort through all of the possible solutions to find the best. This is why, traditionally, the human creates repeated nests. By repeating, the length of time to build the nest is spread out over the multiple times that nest runs, thus realizing acceptable programming time. 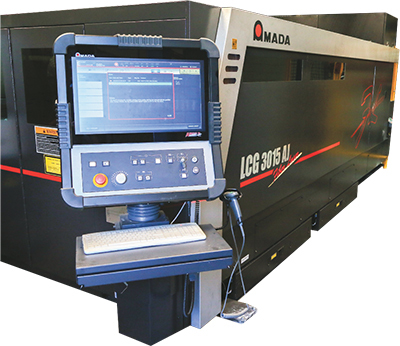 This new fiber-laser cutting machine is one of many machines at Knapheide that employ automated nesting software to more efficiently produce truck parts. Since 1848, the Knapheide Manufacturing Co. has helped move America—first as a wagon builder, then as a supplier of truck bodies. Today, the company’s main manufacturing operation in Quincy, IL, occupies 480,000 sq. ft., with 124 of the plant’s 754 employees performing fabrication-related duties across three shifts. Shop-floor equipment includes CNC shears, plasma and laser cutters, CNC turret punch presses, and press brakes and rollformers, in addition to automated steel-processing cells. Since 1999, Knapheide has used nesting software from Optimation, Blue Springs, MO, building up to where, these days, most of the cutting and punching machines employ the software for customized nesting. Knapheide has gone through several updates and new versions of the Optimation nesting software, including the newest product, Axiom VE. The software pipelines with the fabricator’s MRP system to constantly address new orders or changes, and makes nesting decisions on the fly, according to Knapheide officials. Optimation has custom-designed the software in tandem with the fabricator, using Knapheide employees’ expertise and experience to make automated nesting as efficient and accurate as possible. Order quantities at Knapheide average less than 10 pieces with a “huge amount” of job numbers, so the ability to automatically nest is critical to maintaining JIT status. “We have seen continuous improvement in our materials utilization,” adds Caldwell, “which is a big driver for using the nesting software.” Now spending about 20 percent of his time on programming, Caldwell is able to take the time to leverage his CNC expertise in other areas, such as to coach various manufacturing teams at Knapheide through entire job setups and runs. The company, with savings on the nesting end, can tap the expertise of employees throughout all of its operations. The result is a solidified bond with customers. But as requirements constantly change, especially in job shops with many part numbers, repeated nests become inefficient. A part may be damaged and must be remade. Or, the schedule changes because a purchased part is not delivered on time, machines break down… In short, the shop floor is a constantly changing environment, and any series of nests that extend more than one machine cycle into the future can produce the wrong parts. An intelligent nesting system considers all of the current conditions to produce optimal nests for the next machine cycle, then stops and waits for the next available machine to request a nest. During that wait time, unplanned events, such as those noted above, occur. So when the next machine requests a nest, any new criterion is included in the new optimal solution for the next machine cycle. A new part is scheduled and produced during the next machine cycle; the schedule changes, so all available resources are utilized to make the right parts to support the change. A value stream can show a number of different variables that express time and value. For now, let’s be concerned with savings and transit time for each operation. 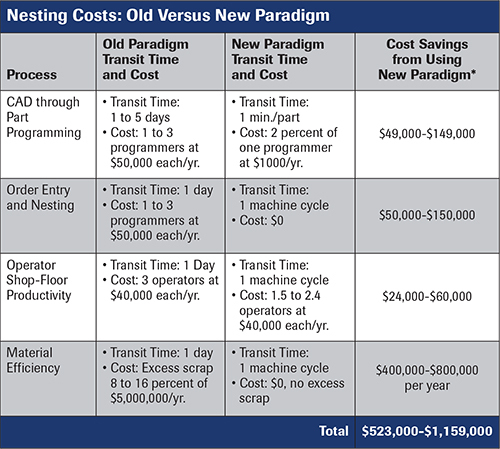 The accompanying table, Nesting Costs: Old Versus New Paradigm, compares the new and old paradigm for a company using three machines and accumulating $5,000,000 in nested raw-material costs each year. To estimate possible savings in order entry and nesting time, determine the number of employees used for these functions each day. Savings will be 100 percent of these costs, as order entry and nesting becomes completely automated. It is important to note that employees freed from traditional nesting tasks will be used, at least in part, for continuous improvement. Additional savings on their salaries will result from benefits of cost improvements that they may implement. In these estimates, it is assumed that continuous improvements will reduce annual costs by a dollar amount greater than the salaries. Therefore, savings shown are the full salaries. The elapsed time from availability of new CAD parts to completed part programs includes not only programming time, but also the wait time from release until a part is programmed. For example, 100 parts released at the beginning of a day and available to be nested by the morning of the next day results in a transit time of one day. The same method can be used for nesting transit time—the elapsed time from when parts are available to be nested until they are run on the shop floor. Article adapted from a white paper, 5th Generation Rapid Transit Time Nesting Systems, provided by Optimation, Blue Springs, MO; tel. 877/827-2100, www.optimation.com.